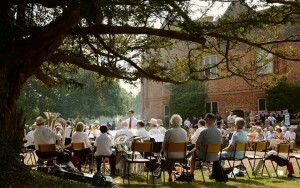 We are a friendly, non-competing brass band based in Bishop’s Stortford. We meet weekly in the Markwell Pavillion, Castle Gardens in Bishop’s Stortford every Tuesday from 7:30 – 9pm. Our ages currently range from teens to 70+ but we welcome players from age 8 upwards. We play for school and village fetes, the town’s Remembrance Sunday Service, priva te events and of course there is a lot of caroling at Christmas. We also put on concerts so that we can have the opportunity to showcase our music. Most importantly, we love meeting up as a band for rehearsals and also performing at our many engagements during the year. We welcome new members either beginners or experienced and also are happy for experienced players to come along for an occasional practice if they cannot commit to regular attendance at band practices.